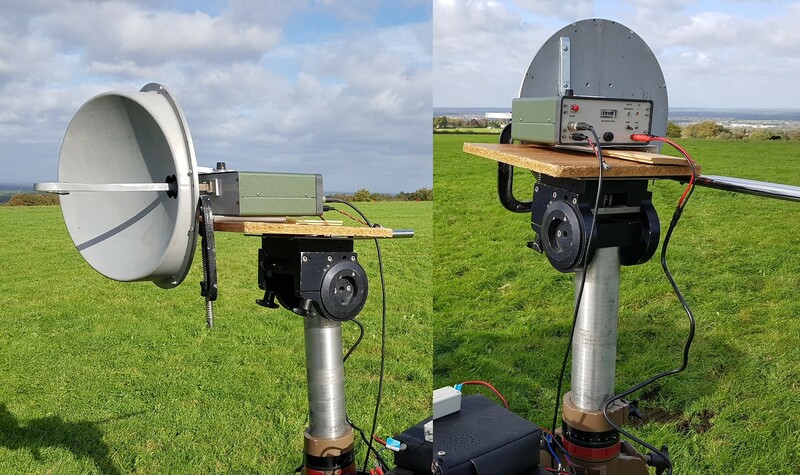 24 GHz is the first of the Millimetre Wave bands and is one of the many areas where amateurs innovate. The short wavelengths lend themselves to portable equipment and high antenna gains to achieve remarkable operating ranges. The 24GHz band is the first Primary band above 144 MHz and is available to all UK Intermediate and Full Licensees. In the UK narrowband operation is centred on 24048 MHz within the UK Amateur Primary segment. The system consists of a DB6NT 144MHz to 24GHz transverter, an early DB6NT LO and a DB6NT amplifier. A waveguide switch reverses the amplifier around between transmit and receive. The dish and feed are believed to be from ex-BT 18GHz equipment. Around 1W input is needed at 144MHz for full output of around 10mW at 24GHz and the unit is accurate to within a few kHz after a relatively short warm up period. Note this is available to loan to use in the UK only, due to insurance issues. Loanees must arrange collection and safe return.